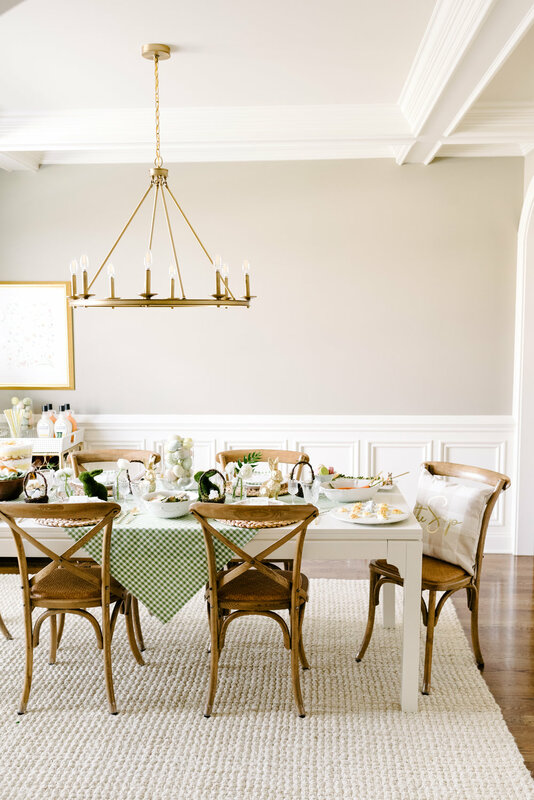 I love Sunday brunches, there is something wonderful about having loved ones around the table after a relaxing Sunday morning or church service. 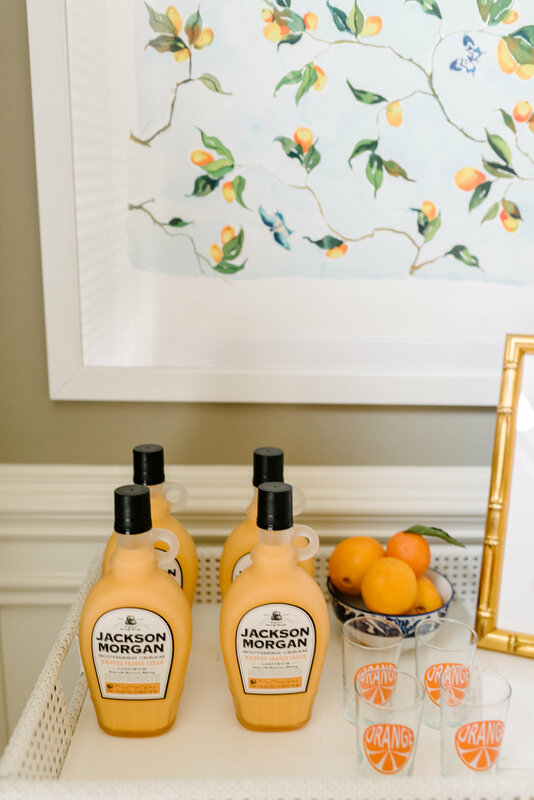 Jackson Morgan Southern Cream’s whipped orange cream is my favorite flavor to serve when the temperatures start to warm up for Spring. With Spring around the corner, I love the classic combination of blue and white with pops of orange. It is a refreshing color scheme after what feels like an extended winter. I had a sweet neighbor growing up that started my chinoiserie collection with a ginger jar she used as a vase for flowers. Since then, I have grown my blue and white collection. I love anytime I get to incorporate my treasured pieces into a tablescape. 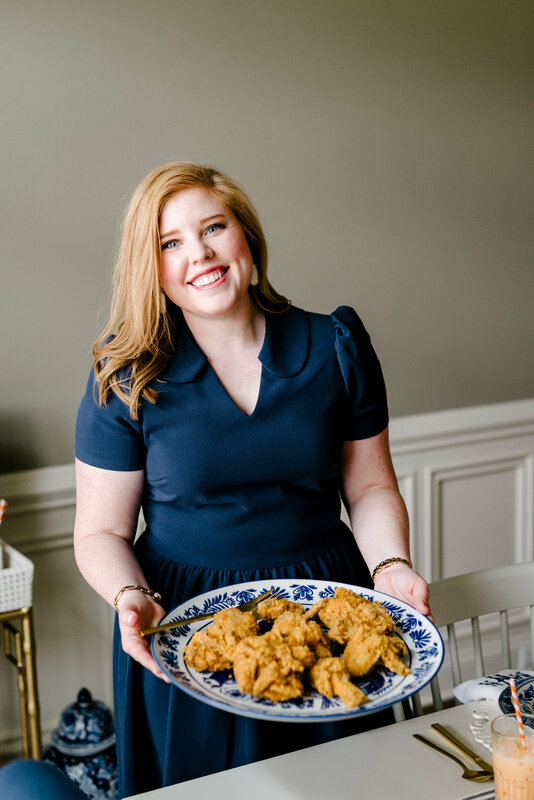 For the menu, I served southern staples. We had fried chicken, mixed green salad, garlic green beans, cheese tray, potato salad, deviled eggs, and rolls. For dessert, orange chocolate cookies and a boozy creamsicle cake (recipe coming to The Sip soon). I incorporated oranges whenever I could to keep with the citrus party theme. I included orange marmalade on the cheese tray, orange slices on the salad, and Jackson Morgan whipped orange cream in the boozy cake. You could easily pick up these food items from the grocery store and serve in your own dishes for easy entertaining. Why wait for a fancy occasion to use your nice entertaining pieces? I love to pull out my nice linens and plates for everyday occasions. I used South of Libbie navy monogrammed linen napkins and fancy blue patterned plates. A simple striped runner was used down the center of the table, I had a mix of serving dishes from Juliska, Nora Fleming, and William-Sonoma. The orange tree was such an easy centerpiece (the DIY coming soon to The Sip). For the place settings, I pinned watercolor place cards from Ruthie and Oliver Letterpress to mini oranges. I like to keep place cards with my family member’s names on hand for last minute entertaining. It is a nice touch that rarely goes unnoticed. Special thanks to South of Libbie, Nora Fleming, Society Social, Juliska, and Ruthie and Oliver Letterpress for partnering with us on this party. You can shop this post below. All images Christy Wilson Photography. We have shared our Winter Dinner Party with Mostess box last week. Earlier this week, we shared details about the menu. Now it is time for the bar cart. 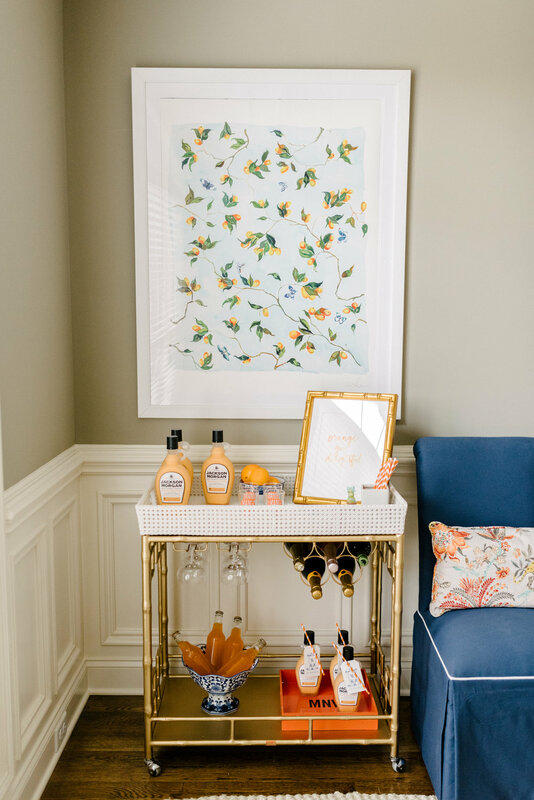 I always get questions about how to style a bar cart. My biggest tip is not to over think it. Hang a festive wreath, add a few books, your favorite liquors, and a few pretty glasses. You want the the bar cart to be functional as well as pretty. For winter, I used a pinecone wreath to incorporate the pinecone theme from the table. I layered a few of my favorite winter cocktail books with bottles of Jackson Morgan. In the Mostess Box, I received this mini decanter, gold tray, and pinecone gift tags. On the bottom, I used my beloved Sasha Nicholas champagne bucket as a pot for this faux pine tree, you may remember these from my Christmas tablescape a few years ago. Since it was a cozy night in, I wanted to serve a decedent martini. I rimmed these pretty Juliska martini glasses with chocolate and crushed peppermint before guests arrived to save time when preparing cocktails. The gold tray worked great for serving drinks for the table. Stay tuned for cocktail recipes coming next week. 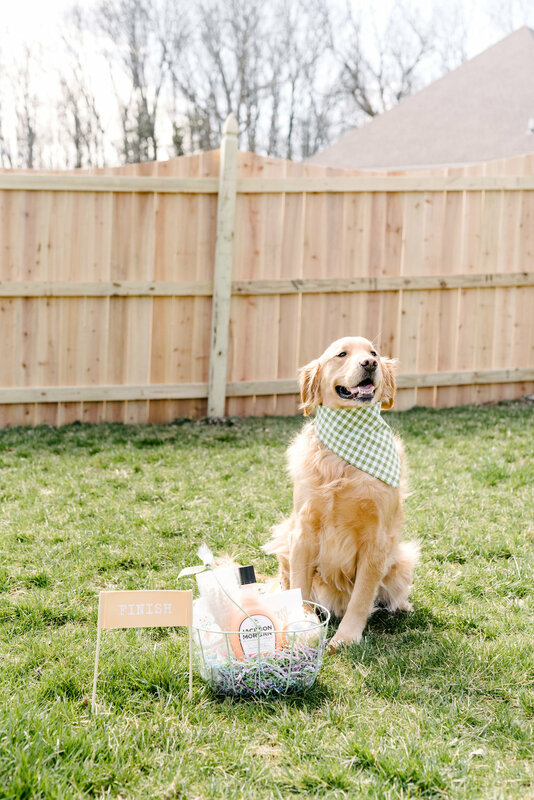 Thank you to Mostess Box for partnering with us on this post. Christy Wilson Photography. 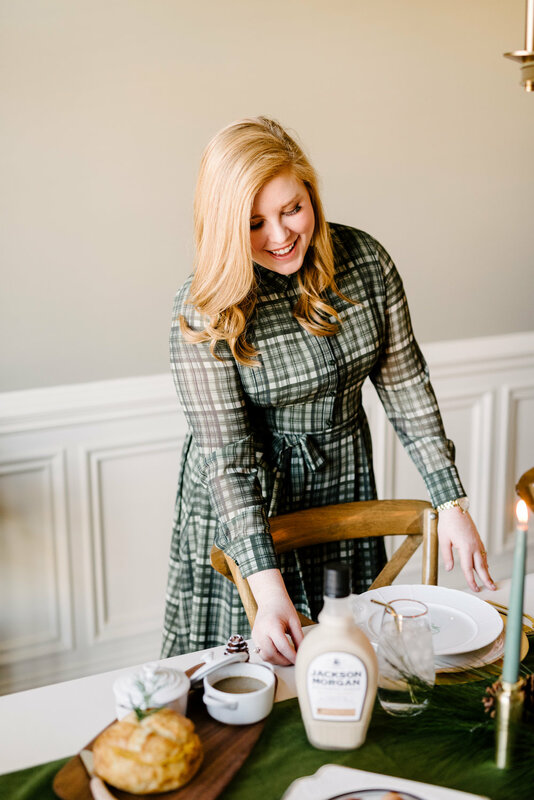 Did you catch our Winter Dinner Party blog post last week? This week we are sharing details about the food. I prefer to serve heavy appetizers for a dinner party. It takes the pressure off having to create a full meal for guests and everyone still leaves with full stomachs. It also gives guests different entree options in case of food allergies. I recently learned about The Orderves Company, which makes hosting so much simpler. They ship gourmet appetizers to you frozen. When you are ready to serve, just heat in your oven. Not only is everything delicious, the food looks pretty too. I like to keep a few in my freezer for when last minute company comes over. I add garnishes such as fresh herbs, nuts, crackers, drizzle of honey, etc and serve on my best china and no one knows the difference between frozen and homemade. For our dinner party, we ordered the brie en boule, French dip sliders, bacon wrapped dates, mushroom soup, and mini ham and cheese sandwiches. It was the perfect menu for a cozy night in when the weather is chilly. The mini sandwiches were a huge hit since they are a fancy grilled cheese. We also loved the French dip sliders. If you wanted to add another entree a hearty soup or baked chicken dish would compliment these dishes. Stay tuned for more about our Winter Dinner Party. Special thanks to The Orderves Company for partnering with us on this post. Christy Wilson Photography. I have been crushing on Mostess Box lately, it is a curated subscription box that is sent seasonally. Each box contains home and hosting essentials. 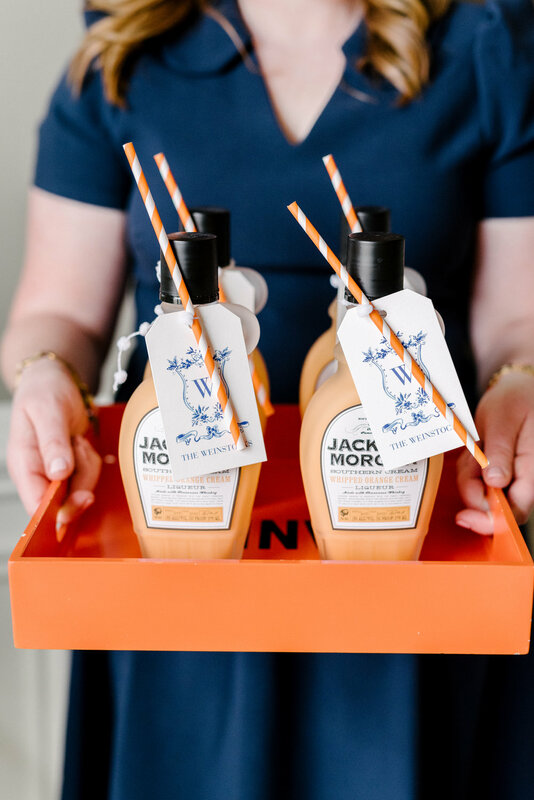 I am not much of a subscription box gal, but when entertaining items are included, count me in! We were gifted the winter box and used the pieces for our winter dinner party that we posted about earlier this week. 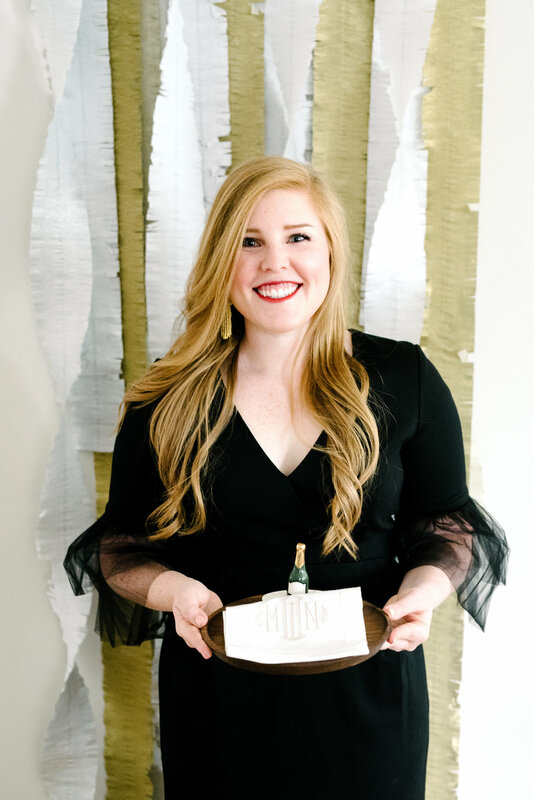 The gold metal straws, Frasier Fir candle, gold tray, mini decanter, pine cone gift tags, and burnt sugar simple syrup were included in the winter box. Along with the home goods, the box includes styling tips, recipes, and more. To say that I am obsessed would be an understatement, I have loved the high quality pieces in the winter box. Stay tuned for cocktail recipes with the burnt sugar syrup and more posts from our winter dinner party! Anyone else sad the holidays are over? To ease back into normal routines, I wanted to host a winter dinner party. Winter can be long without much to look forward to, why not have a few friends over for a fancy dinner party? Jackson Morgan paired with hot chocolate can help lift the winter blues. To bring in texture, I add a velvet runner down the middle of the table. I scored green taper candles that matched perfectly and once lit helped create a lovely ambience. I love to mix china patterns, I layered gold edged china with my beloved monogramed plates from Sasha Nicholas. Our friends at Mostess box sent over their winter box, which included these fun gold straws and Frasier Fir candle. 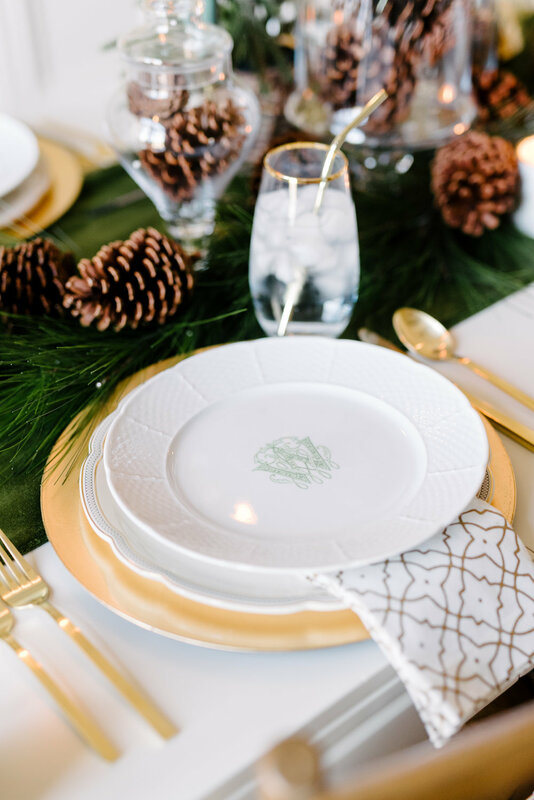 After deciding to use pinecones, it only felt right to stick with an evergreen, brown, and touches of gold for a color scheme. The navy rug and chairs tied in nicely with theme. I mixed in wooden serving boards to bring in warm color tones. The touches of gold added a luxe feel to the party. 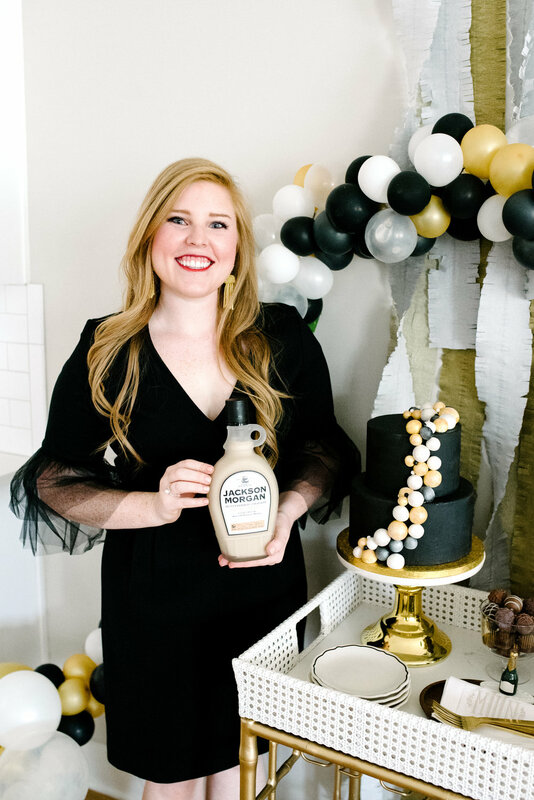 It does not hurt either that our salted caramel cream bottles matched perfectly. I use apothecary jars year round and change out with different seasonal fillers. During the holidays, I had Christmas ornaments in these jars. For this dinner party, I opted for pinecones. I found pinecone branches that were meant to be stems for a vase, but placed around the jars to create a semi garland down the table. Special thanks to Mostess box, Nora Fleming, Juliska, Society Social, and The Orderves Company for partnering with us on this dinner party. All images Christy Wilson Photography. You can shop this post below. Happy New Year from the Jackson Morgan Southern Cream team! 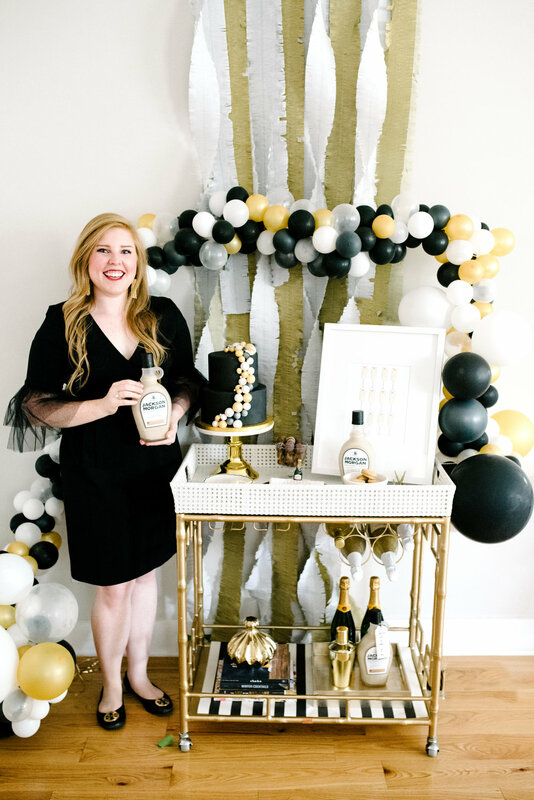 We shared our New Year’s Eve party last week, today we are sharing details about our bar cart from the party. A bar cart makes it easy to have a cocktail station and leave more room on the table for food. I used my bar cart for dessert too. I served this fabulous cake by Copper Whisk Cakes, chocolate truffles, and gold leafed macaroons. 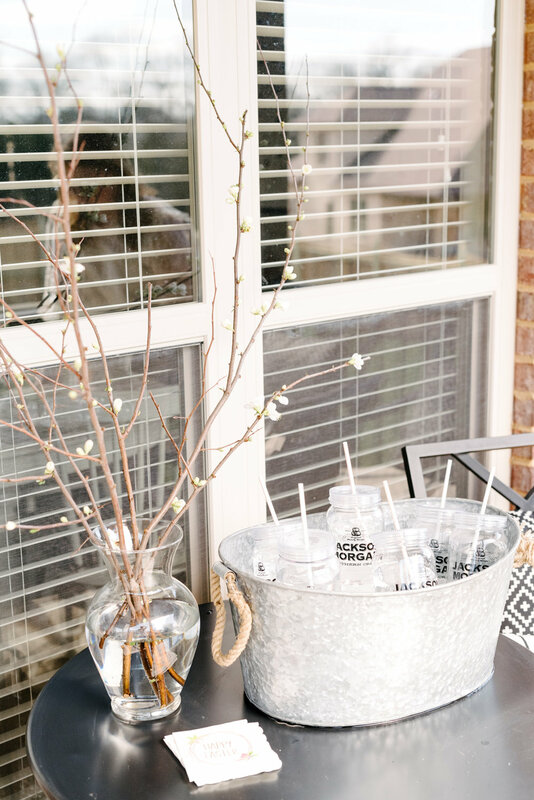 I incorporated the black and white theme from the party to the bar cart with the striped runner and streamers. 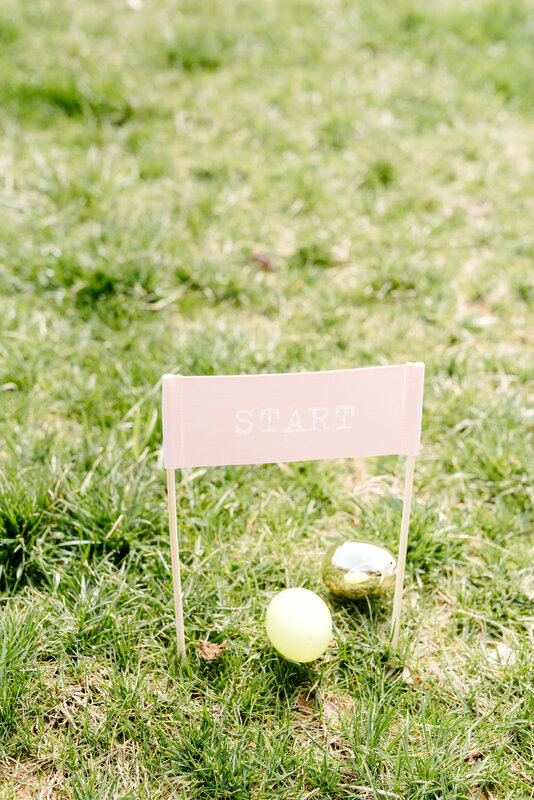 Typesetter designed this adorable champagne print. Instead of paper napkins, I love to use linen cocktail napkins to help elevate a party such as my monogram ones from Lettermade. Behind the bar cart I used streamers and the balloon garland to create a photo booth backdrop when I rolled the bar cart out of the way. Our salted caramel cream was the perfect drink to serve especially when garnished with chocolate truffles. 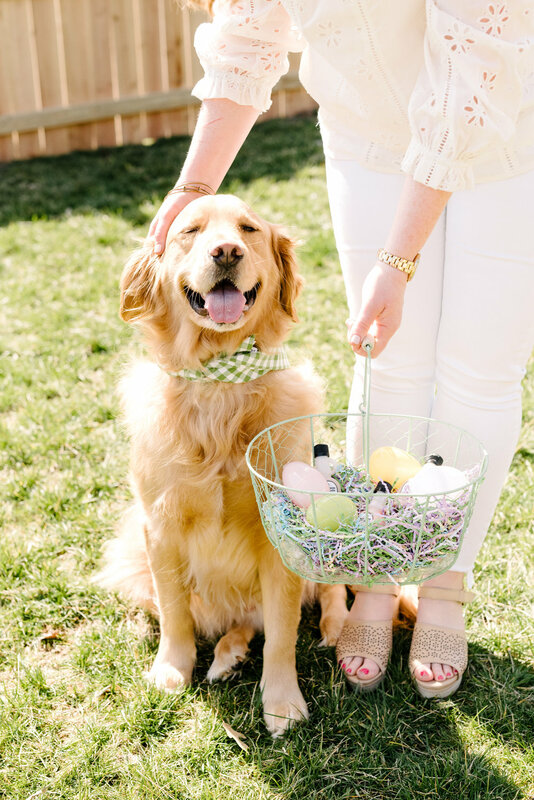 Photos Christy Wilson Photography, you can shop the post below. New Year’s Eve is next week, how are you planning on celebrating? I always love to plan a dinner party with our closet friends and family. I ask everyone to dress in their best cocktail attire like this Camilyn Beth dress and enjoy one last meal together before ringing in the New Year. With the black, white, and gold balloon garland from Vroom Vroom Ballon being over the top, we did not need much decor other than a stripe runner down the table. 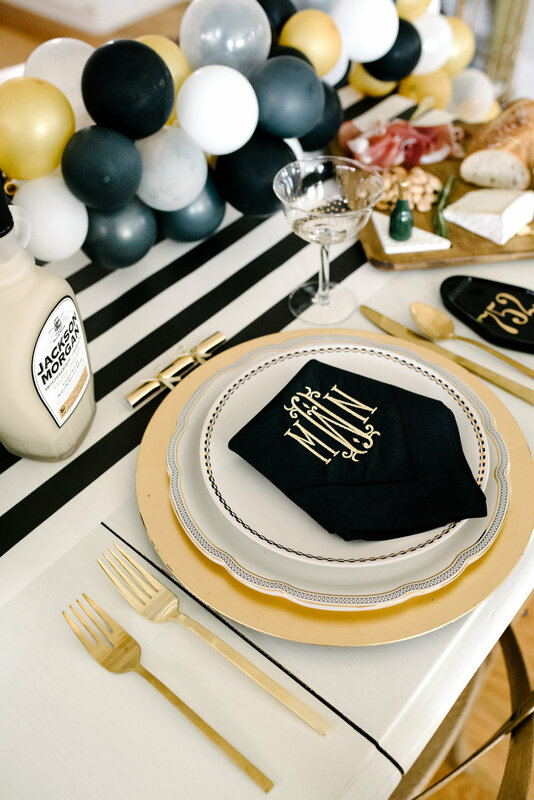 Monogrammed black napkins adored each plate along with a gold party cracker. I brought out my white, gold, and black china and used matching serving dishes along with my Nora Fleming favorites to keep the table simple. How cute is the champagne bottle mini? New Years as the last hurrah for the holiday season. To celebrate, we always have indulgent foods such as filet mignon, truffle Mac and cheese, cheese boards, baked brie, and rich cocktails. Copper Whisk Cakes made this fabulous tiered cake that matched the balloon garland. 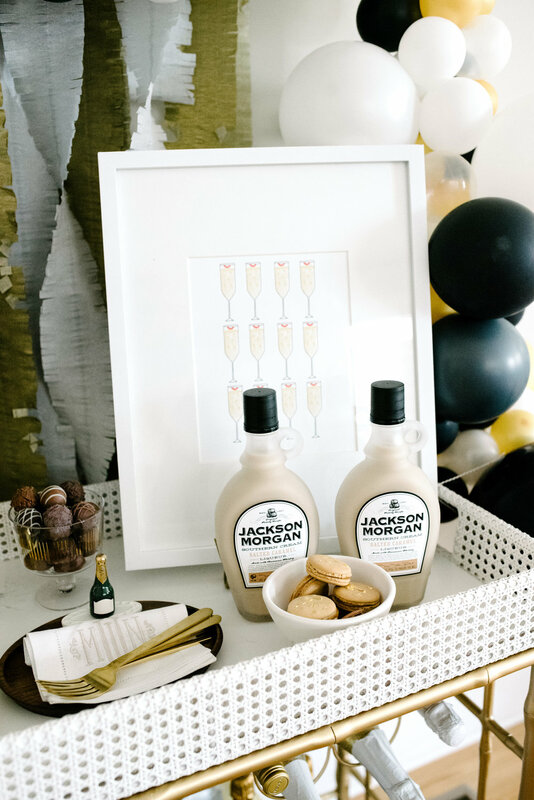 Our salted caramel cream is my favorite Jackson Morgan flavor to serving during NYE. I poured into fancy coupe glasses and added a chocolate truffle garnish, so simple but looks decadent. The party crackers are my favorite party trick, each one has a conversation starter in it. During dinner you take turns opening each one. After dinner, I moved the ballon garland to where the bar cart is to create a Photo Booth area for guests to take pictures. I normally bring out board games and turn on the ball drop in New York while everyone enjoys cocktails. Stay tuned for more details from our New Year’s Eve party. You can shop this post below. 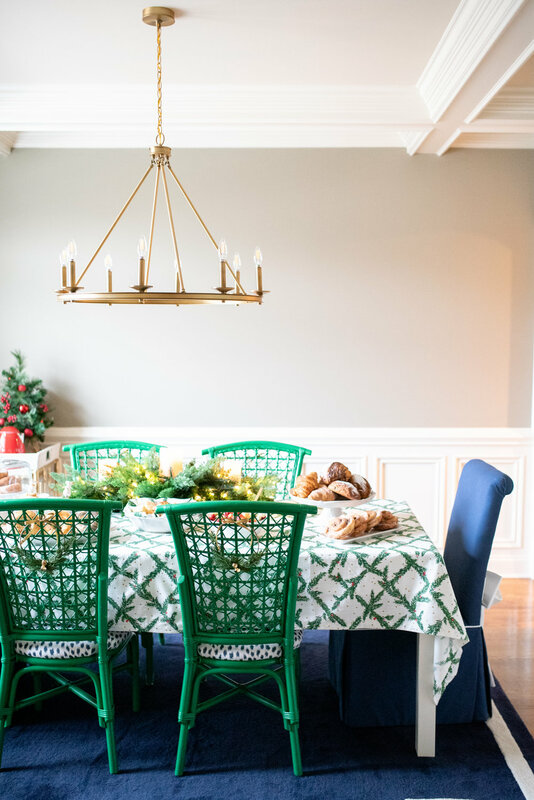 Did you catch our Christmas brunch and bar cart posts from last week? Today we are sharing all the details about the menu we served for our Christmas brunch. I love to cook and bake, but during the holidays, I prefer to delegate. This year I went to a few of my favorite brunch spots and ordered a catering order for my brunch party. I plated on pretty serving dishes from Juliska and it instantly looked elevated. Happy Wednesday! Every Wednesday in November and December leading up to Christmas we are hosting a giveaway to celebrate the holiday season. Check out our Facebook and Instagram pages for a fun giveaway with these festive napkins from Lettermade and two Juliska old fashioned glasses. These are the perfect items for a Christmas cocktail party, just add a bottle of Jackson Morgan peppermint mocha. This year for Christmas, I wanted to host something different than your typical Christmas dinner. I opted for a Christmas brunch where I asked everyone to come in cozy pajamas and slippers to sip on spiked coffee and enjoy breakfast treats. Since the holiday season is always busy, a brunch time slot was perfect for everyone’s schedules. I wanted to use my coveted green chairs from Society Social. I tied mini wreaths to the back of the chairs with gold ribbon. The greenery centerpiece with battery operated candles and lights made the party festive and since it is faux, I can use year after year. You could also recreate with real greenery. I like to keep things simple during the holiday season with decor since it is easy to go overboard. Since it was a causal event in pajamas, a formal sit down with placemats did not seem right. A buffet style set up with bagels accompanied by cream cheese, donuts, Brightside Bakery treats, assortment of biscuits, and fruit was perfect for this party. 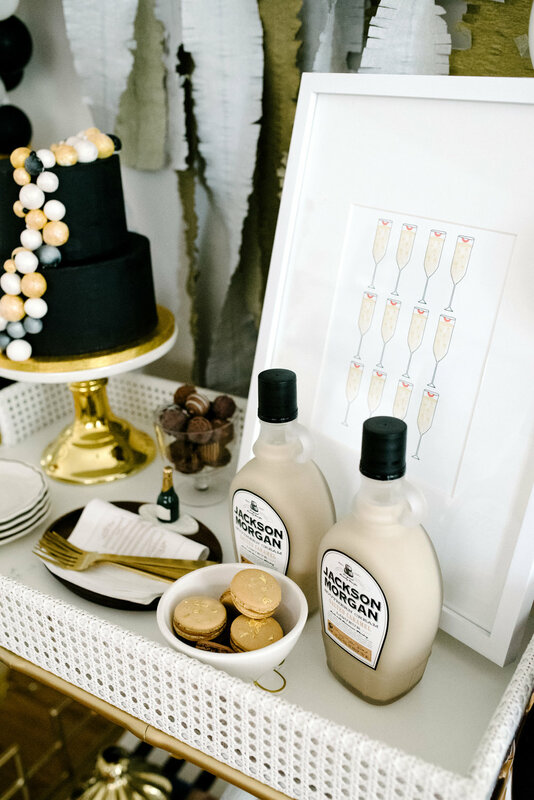 We had a bar cart full of Jackson Morgan Southern Cream and garnishes for spiked hot chocolate or coffee. I kept to traditional red, green, and gold colors. I added in navy with the rug and Society Social bow back chairs. The touch of navy freshened up the normal Christmas color schemes. Since the table and food was colorful, I used only white serving pieces from the Berry and Thread collection by Juliska. Stay tuned for more details from our Christmas brunch party. You can shop this post below. One of my favorite pieces for fall entertaining is my white pumpkin Staub Cocotte, it is perfect for soups, Thanksgiving sides, and more. As an added bonus, it looks pretty when serving. I keep it on my stove during the fall season. Check out our instagram and facebook pages this afternoon to learn how you can win a 3 1/2 quart white Staub pumpkin cocotte. Winner will be announced next Tuesday (11/27). We hope y’all are enjoying these giveaways as much as we have been!